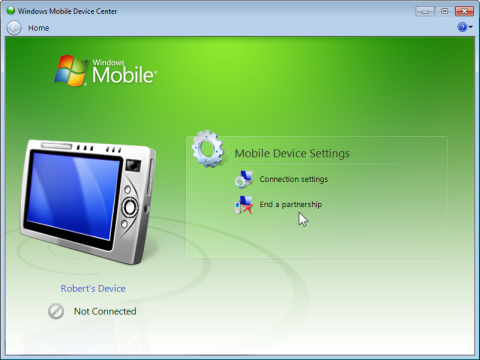 When using Windows Mobile Device Center to create a connection between your PC and Navigator, there is no need to create a partnership between the devices. The only function which WMDC is required to perform is to provide a communications "bridge" between the PC and Navigator. If you establish a partnership, it can affect the ability of the Hema Explorer software to communicate with the Navigator. This article will show how to remove an unwanted device partnership. You can tell if you have a partnership established when you look at the WMDC window while your Navigator is connected. You will notice the status in the lower-left of the window showing the Last Sync time. This will NOT be present unless there is a partnership established. To remove a partnership with a device, open Windows Mobile Device Center on your PC WITHOUT THE DEVICE CONNECTED. You will be prompted to confirm that you wish to end the partnership, click Yes to continue, and end the partnership. If you see the following prompt, it means you have your device plugged in while trying to end the partnership. You cannot end a partnership with a device while it is connected to the PC. In this case, disconnect the device, and restart the process.